Clowns Without Borders was founded in Barcelona in July 1993. 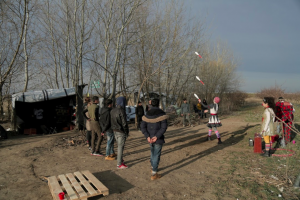 The idea began when Tortell Poltrona, a professional clown in Spain, was invited to perform in a refugee camp in Croatia. This performance unexpectedly attracted audiences of more than 700 children, proving to Poltrona that there is a great need for clowns and entertainment in crisis situations. He founded Clowns Without Borders to offer humor as a means of psychological support to communities that have suffered trauma. Read the UNHCR interview with Tortell Poltrona. Another project was organized for May of 1993, and this time two more artists, Boni & Caroli, accompanied Tortell, traveling and performing in the refugee camps in Croatia. What followed was a wave of performers and shows in the ex-Yugoslavia region from Spain. Soon Clowns Without Borders organizations sprung up in France and Sweden. The CWB movement expanded into other areas of conflict, from the Western Sahara, to Palestine and Israel, to Colombia and other countries throughout Central America. By the year 2000, over one hundred expeditions had been launched. After traveling to perform in Guatemalan refugee camps in Chiapas, Mexico (1987) and in South African township schools (1991), Moshe Cohen participated with the French, Clowns Sans Frontieres, in Croatia (1994) and performed in eleven refugee camps in eight days. He then started Clowns Without Borders USA in 1995. Clowns Without Borders USA continues to be a grassroots, volunteer-run organization. With the support of many volunteers, and the hardworking board, the organization continues to strive to bring laughter and humor to children and persons in areas of crisis. Now with Clowns Without Borders organizations in fifteen countries (Australia, Austria, Belgium, Brazil, Canada, Finland, France, Germany, Ireland, South Africa, Spain, Sweden, Switzerland, the United Kingdom and the United States) we hope to work together to send at least one hundred projects throughout the world each year. The objective of this code is to provide a series of written guidelines of ethics for all clowns and artists who collaborate with Clowns Without Borders. The clown or collaborating artist will hold as fundamental objectives to better the situation of children who live in crisis situations of whatever type (conflict, natural disaster, social inequalities, etc.) in whatever part of the world. The main beneficiaries of CWB projects are children living in situations of crisis and the clown or collaborating artist will make no distinction between them for reasons of race, age, religion, culture, social situation or any other categorization when offering his/her work. For clowns and collaborating artists participating in CWB projects, volunteerism is the general rule. In respect to the clown/artist’s public image, he/she will not use the participation in humanitarian activities as a means to promote their professional career, separating clearly at all times such activities and not using his humanitarian work for publicity purposes or to promote his/her professional career. The clown or collaborating artist will not use their humanitarian activities to impart personal ‘points of view’ to the destination populations of the projects and will limit themselves to sharing their artistic activities. The artist will not attempt to “educate” the population, refraining from any “evangelical” activities. The clown or collaborating artist, when choosing the contents of his/her performances and workshops, will consider the sensibilities of the destination population, taking into account their culture as well as the delicate situation in which they are living. The clown or collaborating artist when working with CWB projects sees and shares difficult situations. Their work does not end when they return home. They should testify in the measure possible all situations of injustice that they have witnessed. When participating in a project, during our performances and in our contact with the public, we remain clowns and artists, and this is the sole method with which we express and experience the validity of our actions. We remain vigilant and attentive that the name, logo, and identity of Clowns Without Borders will not be will not be used as a vehicle for remuneration. In the matter of seeking financial support, we remain attentive to the ethical values and the respect of human rights of our sponsors and partners.